While the IRS creates the impression that involvement by both spouses in an unincorporated business automatically creates a partnership for federal tax purposes, in many cases, it will have a tough time making the argument — especially when: the spouses have no discernible partnership agreement, and the business hasn’t been represented as a partnership to third parties, such as banks and customers. 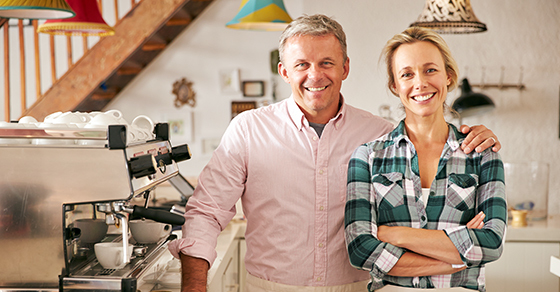 If you can establish that your business is a sole proprietorship (or a single-member LLC treated as a sole proprietorship for tax purposes), only the spouse who is considered the proprietor owes SE tax. Let’s assume the same facts as in the previous example, except that your business is a sole proprietorship operated by one spouse. Now you have to calculate SE tax for only that spouse. For 2017, the SE tax bill is $23,023 [($127,200 × 15.3%) + ($122,800 × 2.9%)]. That’s much less than the combined SE tax bill from the first example ($38,250). 2. Establish that you don’t have a 50/50 spouse-owned partnership Even if you do have a spouse-owned partnership, it’s not a given that it’s a 50/50 one. Your business might more properly be characterized as owned, say, 80% by one spouse and 20% by the other spouse, because one spouse does much more work than the other. Let’s assume the same facts as in the first example, except that your business is an 80/20 spouse-owned partnership. In this scenario, the 80% spouse has net SE income of $200,000, and the 20% spouse has net SE income of $50,000. For 2017, the SE tax bill for the 80% spouse is $21,573 [($127,200 × 15.3%) + ($72,800 × 2.9%)], and the SE tax bill for the 20% spouse is $7,650 ($50,000 × 15.3%). The combined total SE tax bill is only $29,223 ($21,573 + $7,650).